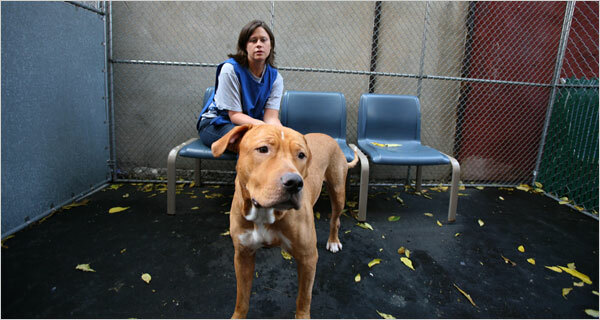 Jenny Daniel, a volunteer at Animal Care and Control of New York City, with Bricky, who was given up by its owners this week. With all the talk of bulls and bears lately, what’s happening to cats and dogs? Adoptions are down, and more abandoned pets are coming in. Some pet owners “can’t even afford food,” an official said. At New York City’s main animal shelter, monthly calls to the volunteers who can help people keep their pets through tough financial times doubled, to 225 from 115, between January and September. Volunteers who work for the shelter’s four-year-old Safety Net program provide struggling pet owners with low-cost boarding or pet-training services, food donations, lists of apartment buildings that allow pets, even legal help if a landlord is trying to illegally evict a pet owner. As the country’s financial crisis has deepened, more pet owners are asking the shelter for help. Sadie Judge, 50, has been living with friends and relatives ever since she got sick and lost her teaching job at Brooklyn College as well as her apartment. “I kept saying, ‘At least I’ve got my kitty cats,’ ” Ms. Judge said. But in early September, without her permission, she said, her roommate’s boyfriend took her four cats, Michael, Michelle, Molly and Gunzu, to Animal Care and Control, on East 110th Street between First and Second Avenues. Ms. Judge said that after learning from her niece where her cats had been taken, she was told that she had 24 hours to get them out or they would be put up for adoption. But she had nowhere to take them. She was in tears when she happened to look up and see the Safety Net poster. Within two days, her cats were in two separate foster homes, and she hopes to get them back when she finds permanent housing. Animal Care and Control took in 9.4 percent more pets in the first half of 2008 compared to the same months in 2007. However, in the 12 months that ended in August, 168 fewer dogs were adopted than in the previous 12 months. He said the agency needed to recruit three times the number of new foster homes for pets to keep up with demand, in part because many people who serve as foster petkeepers end up adopting them and leaving the program. The situation is much the same at shelters throughout the country. Betsy Saul, founder of Petfinder.com, a national pet adoption Web site, said that smaller shelters simply did not have enough food, while donations were plummeting. A survey conducted by her site found that 57 percent of shelters and rescue groups were seeing a decrease in adoptions. “We’re hearing that individuals who are caring for feral cat populations with their own money or small rescue groups are feeding them bread soaked in water now, because there’s not enough cat food,” she said. Veterinarians are concerned that pet owners may hold off on medical treatments, like hip replacements, that were more common during flush times, Ms. Saul said. And because research has shown that a typical pet owner starts considering euthanasia once the cost of treating an ill pet surpasses $500, they fear that more owners will make that choice sooner than they have in the past. Kristen Levine, president of Fetching Communications, a public relations firm based in Florida that works with the pet industry, says veterinarians are finding that pet owners have become more likely to skip annual checkups to save money, even though early diagnoses can detect illnesses that get more costly over time. “Some vets are offering special incentives for wellness visits, like a free microchip or free nail trimming, for giving something back to owners for recognizing the importance of preventative health care,” Ms. Levine said. In the worst case, pets become homeless. The number of strays taken in by Animal Care and Control in September increased by almost 300, to 2,902, from last year. As the city’s only open-admissions shelter, Animal Care and Control has to euthanize animals after all adoption and foster care resources have been exhausted. Last year, it euthanized 15,768 animals, 55 percent fewer than in 2000. At that shelter on Wednesday, two women — one of them crying — were surrendering a dog together. They declined to speak to a reporter because they said they were too upset. Nearby, another man was surrendering a stray cat, explaining that someone had dumped it in an alley near his apartment on the Lower East Side. But some people may find that as their savings evaporate, their need for companionship may grow stronger. This weekend at Madison Square Garden, the Mayor’s Alliance for NYC’s Animals will be holding its annual Adopt-a-Cat day, with hundreds of cats and kittens looking for new homes. Prospective owners can fill out a survey that will color-code their personalities to match with available animals. On average, a cat costs $1,000 a year to maintain, compared with about $1,500 a year for a dog, Ms. Levine said. Having a pet can bring healthy returns, especially during bear markets.